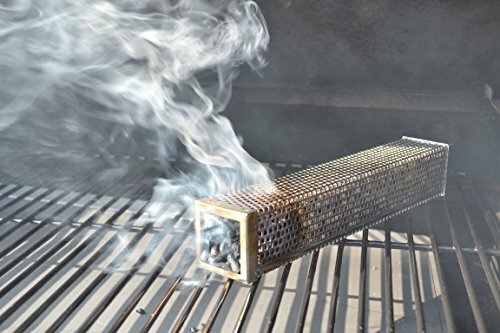 Smoke Daddy Inc. 12'' BBQ Tube Smoker from Use in ANY GRILL! Another great addition to the Smoke Daddy lineup: The 12" BBQube Tube Smoker. Fill the BBQube with your favorite BBQ pellets and experience up to 4+ hours of quality smoke! It takes only a few minutes to light and is designed with maximum air penetration to ensure a constant burn. Made from high quality 301 Stainless Steel! A great gift idea for an BBQ enthusiast. FAST & FREE SHIPPING! Experience up to 4+ hours of quality smoke! Uses any flavor BBQ pellets desired!